I had been looking forward to my First Class flight to Hong Kong on Cathay Pacific for quite some time. I wanted to bask in the luxury of the expansive flat-bed seat and wallow in the attentiveness of the flight staff. The only catch was that I was flying with my four-year-old son on a sixteen hour flight, and with a departure time of 10:05am we would spend all sixteen hours in daylight. A few days before the flight, dread set in. We spent the hour before our flight in the First Class lounge, where my son and I snacked on fresh fruit and yogurt, and a few delicious pastries. I was proud of myself for limiting his sugar intake though, and decided that my wife would be proud of me too for how well my son was behaving. But when I realized we only had about fifteen minutes before we would be confined to a closet-size space for sixteen hours, I also decided it was ok to play catch with my son in the lounge, using an orange. The orange and lounge survived, and the one other patron, an elderly Japanese business man seemed not to mind. Dads rock! The minute we boarded the plane we experienced the renown courtesy and attentiveness of the staff. Of course it is politically incorrect to say this, but I was comforted and calmed by the fact that the staff were all young and attractive women. We had the entire First Class cabin to ourselves, which prompted one flight attendant to proclaim “You have the whole space, you can party if you like!” Well, maybe not party, but at least I didn’t have to worry about my son ruining the experience for anyone else. Each suite (we had 1A and 1D) was spacious, with plenty of room for us to sit side by side in either one. There was a constant stream of delicious food, available any time on demand. We ate about every two hours, and I neglected to take photos of it all. We started with strawberry energisers, eggs and bacon, and some breakfast breads, then for lunch having croque monsieur and roasted duck and noodle soup. One of the fantastic features of the First Class seat is its ability to serve as a functional equivalent to a restaurant table for two – with even more space than a typical table at any number of Manhattan bistros! Maybe it is just my Caucasian taste buds, but I found the Western fare to be significantly better than the Asian courses that we ordered. The caviar and smoked salmon plate was certainly the best of any flight, and comparable to that of a very good restaurant. The creamy butternut squash and apple soup was yummy. On the other hand, the double boiled pork and conch with wolfberry soup tasted thin and stale. By the time we got around to ordering dessert we were nearly completely stuffed. 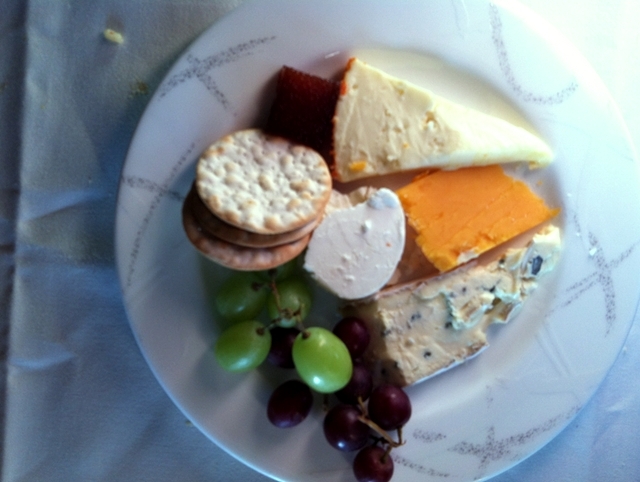 I had the cheese plate. My son had vanilla Haagen Dazs, his favorite dessert (and better quality ice cream than on United BusinessFirst domestic flights). The first ten hours of the flight we spent eating, reading stories, playing games, and watching DVDs. Finally I coaxed my son into his flat-bed and tucked him in. I then lay down on my own seat, which amazingly fit my entire 6’5” frame lying straight out, with room to spare. There was ample width for my son and I to sleep side by side, but by now I wanted to relax on my own while he slept in the seat in front of me. I watched a film, and then drifted off for the last hour of the flight. All in all it was an amazing experience, but I am not sure how I will respond to a regular flight after being so spoiled. Update: I switched with my wife to fly business class on the return flight, and my wife sat with my son in first. Here's my wife's review of Cathay Pacific First Class Hong Kong to New York. My wife booked Cathay Pacific First Class using pre-devaluation British Airways miles from the British Airways Visa, plus our signup bonuses from the Chase Sapphire Preferred. She tells me that the best deal now is to use 135,000 American AAdvantage miles for first class on Cathay. See BankDirect: Best Way to Earn AAdvantage miles and Best American AAdvantage Miles Bonus Offers Available Now to earn the miles.